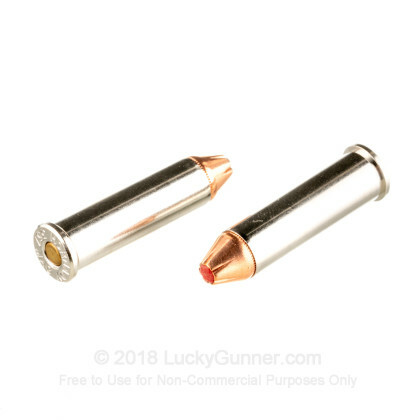 This is top of the line, premium 357 magnum defense ammunition! 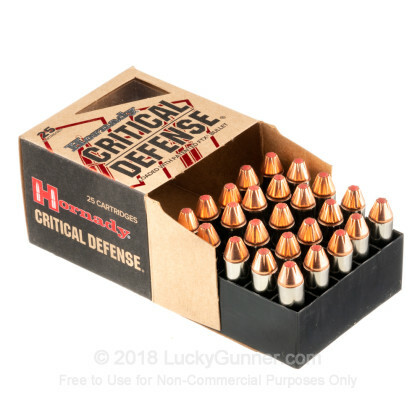 Critical defense ammo expands uniformly and performs well even when penetrating thick clothing. In order to find out how different self-defense handgun loads perform, we decided to do some ballistics gelatin testing of our own. The chart below is a compilation of expansion and penetration data for Hornady 125 gr Critical Defense FTX fired from 10 feet, through four layers of fabric (to simulate clothing), using a Kimber K6s pistol. The diagrams at the bottom of the page can give you an idea of how this load compares to other .357 Magnum self-defense loads that we tested. 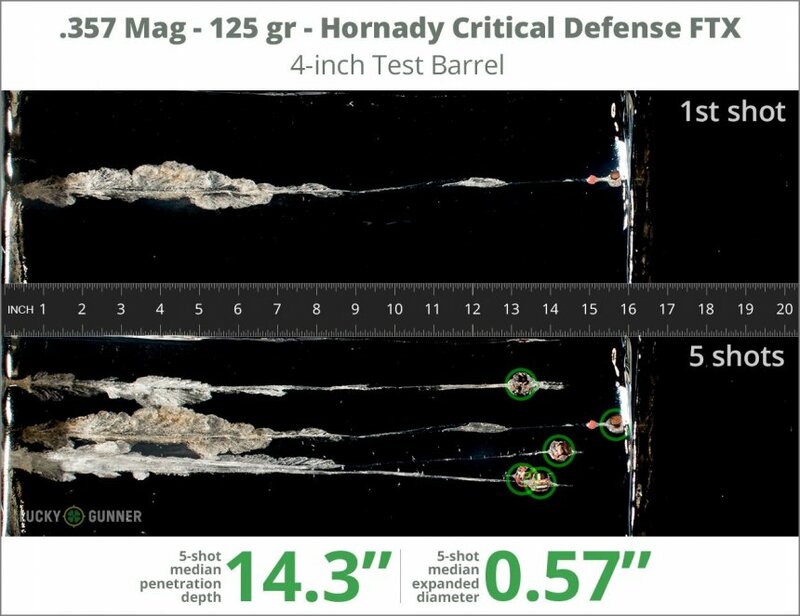 How do the results for this Hornady .357 Magnum compare to other 357 Magnum Ammo? 0.75" This ammo: 0.52" Min: 0.35" Median: 0.55" Max: 0.75"
15" 0" 9.2" 17.3" 41.7" This ammo: 15" Min: 9.2" Median: 17.3" Max: 41.7"
In order to find out how different self-defense handgun loads perform, we decided to do some ballistics gelatin testing of our own. The chart below is a compilation of expansion and penetration data for Hornady 125 gr Critical Defense FTX fired from 10 feet, through four layers of fabric (to simulate clothing), using a Ruger GP100 pistol. 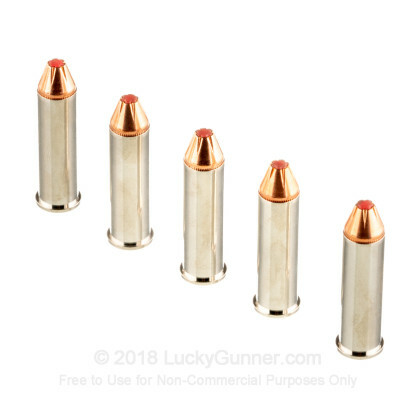 0.75" This ammo: 0.57" Min: 0.35" Median: 0.55" Max: 0.75"
14.3" 0" 9.2" 17.3" 41.7" This ammo: 14.3" Min: 9.2" Median: 17.3" Max: 41.7"
I shoot these in my Kimber K6s and I find less “kick” with these .357’s than 38 spl thru my S&W J Frame. Very manageable with acceptable shot recovery. I have my K6s loaded with the as my EDC. Look like they'll do the job. I bought these as I liked the model Hornady has made and honestly found myself trusting them to do a good job. Haven't fired any yet, will fire 7 so I'll have a solid 3 loads left to work with so I can get an idea of what there like when fired. Honestly, first thought I had upon opening them was they looked pretty in a deadly little 357 magnum defense round way. Loved the price LG offered them for and very likely will buy more from here. 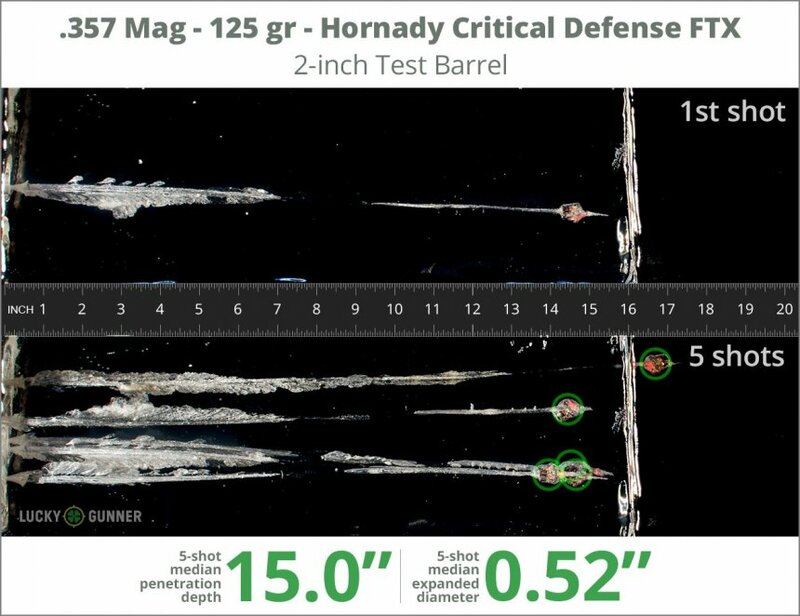 You can't fault Hornady's ammo. Read the reviews, watch the Youtube videos of these rounds. Have my GP100 loaded with these at all times and will have 38spl +p's in my wifes S&W when she gets it. These are good rounds when, God forbid, the chips are down. 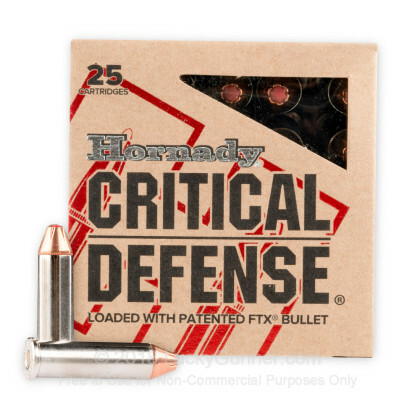 I recently switched to Hornady for my home defense .357 Magnum ammo. A bit pricey, but not surprising given this company's quality product and reliability. As always, kudos to Lucky Gunner for unsurpassed customer service! Bought this for the good Hornady reputation. Lucky gunner provides top quality products with easy service. Absolute great wild Hog and Self Defense Round! One shot one Hog. It just does not get any better than that! If this round performs this well on a wild Hog, it will stop any bad guy breaking into your home. look out bad guys. this ammo has lots of power. and not much stands in the way. when strait though 1 1/2 of drywall and still exploded watermelon and dug deep into backstop. 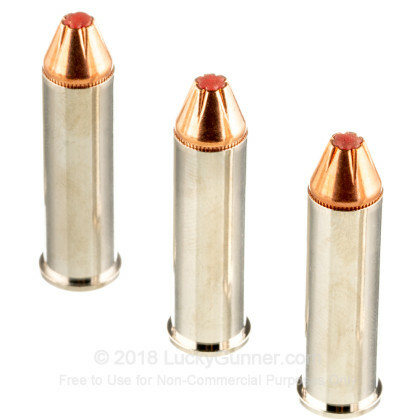 some of the best self defense rounds you can get at a great price. Good groups at 25 yards from my 4" GP100 and seems cleaner than average. Recoil is on the mild side. However, the chrono says it's only doing about 1370 +/- f.p.s. from my gun. Some production lots of Remington L357M1B will break 1500 f.p.s. from this gun, though with really flat primers and really sticky extraction. From the testing I've read this seems to be a fairly decent defensive round--it expands well, it penetrates well, it seems like a good bet to destroy a lot of tissue--but I wish they were loaded hotter. This is something we see with a lot of Hornady factory loaded .357, velocities 100 f.p.s. or more below what we would expect for a given bullet weight. Ballistically, this ammunition does everything which Hornady advertises. "LuckyGunner" has exceptional service, and the delivery took less time than expected. I will be a returning customer, often! This ammo has met and exceeded my expectations. will recommend this ammo to all my friends. Bought this for the good Hornady reputaion. A: There is no reason that it cannot be used. However the powder mix is designed for a faster burn time to maximize velocity out of that shorter barrel. The extra length could possibly result in faster velocities and slightly more penetration, as well as slightly higher chamber pressures, so keep that in mind. It will still work though. 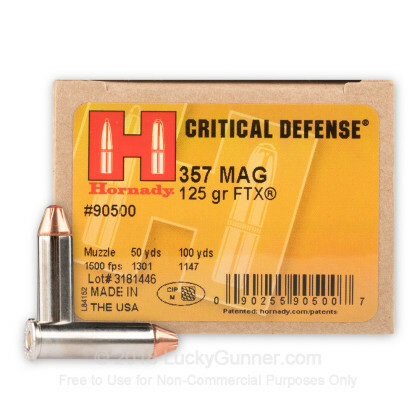 We also have this 357 Mag - 125 Grain FTX - Hornady Critical Defense - 250 Rounds ammo in stock in a bigger quantity.